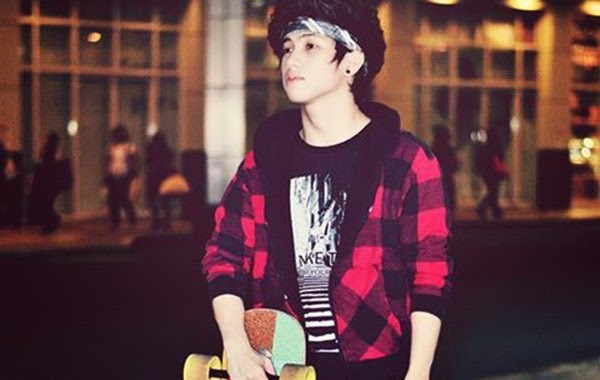 Teen netizens bashed Ranz Kyle Ongsee after the Chicser member posted a photo he tagged as "skate time," which went viral on social media. Post by Ranz Kyle Viniel E.
It seems that Ranz Kyle, notably one of the most popular members of the Filipino boy group, is a bashers' favorite. In December 2014, he and another YouTube sensation wannabe, Karl Zarate, was accused by Taylor Swift fans of ruining the American singer-songwriter's hit single "Blank Space." The hashtag #BlankSpaceCoverByRanzAndKarl became a trending topic on Twiter worldwide after the two uploaded a sponsored music video of their own cover several days before Christmas. Now, RK is on the spotlight again and it's "pretty hard" to figure out why. Is there something wrong with his photo? Can you spot it?